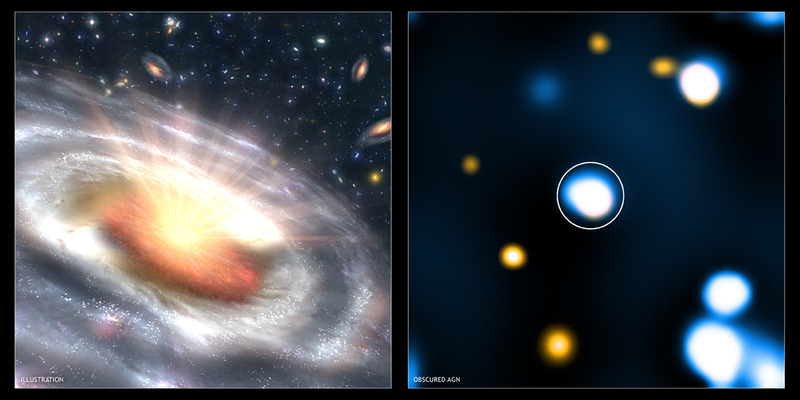 The artist's illustration on the left shows a typical massive galaxy as it would have appeared when the universe was only about a quarter of its current age. This young galaxy contains an active galactic nucleus (AGN), or quasar, in its center, a luminous object powered by the rapid growth of a supermassive black hole. Some of the light from the AGN is obscured by dense gas and dust near the center of the galaxy. The galaxy itself is undergoing a growth spurt, as shown by bright regions of star formation in the spiral arms. Spitzer Space Telescope observations are extremely efficient at detecting distant AGN like this because dust and gas should absorb high-energy radiation from the AGN and re-emit it at longer wavelengths, generating copious amounts of infrared emission. Large numbers of galaxies thought to contain such highly obscured AGN have been discovered in the Great Observatories Origins Deep Survey. The infrared emission for these galaxies exceeds the levels likely to be caused by star formation. However, X-ray observations were required to confirm the presence of obscured AGN, by looking for the high energy X-rays expected from such objects (less energetic X-rays are mostly absorbed). The image on the right shows a "stacked" Chandra X-ray Observatory image of distant, massive galaxies detected with the Spitzer Space Telescope. Image stacking is a procedure used to detect emission from objects that is too faint to be detected in single images. To enhance the signal, images of these faint objects are stacked on top of one another. 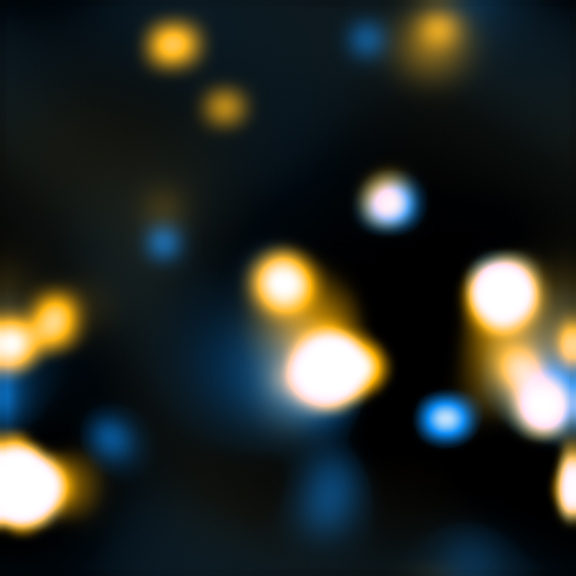 In this image, low-energy X-rays are shown in orange and high-energy X-rays in blue, and the stacked object is in the center of the image (the other sources beyond the center of the image are individual AGN that were directly detected and are not part of the source stacking). The blue stacked source confirms the hypothesis that large numbers of these young, massive galaxies contain heavily obscured AGN. Spitzer also detected infrared emission from young, massive galaxies that is consistent with expectations for star formation. These galaxies do not contain AGN, because their supermassive black holes are dormant. A stacked Chandra image of these "normal" massive galaxies shows mainly soft X-ray emission at the center, as expected. Coordinates (J2000) RA 03h 32m 28s | Dec -27° 48´ 30.00"